State budget corrections bill: A new bonus for municipal charters, suicide hotline to endure? With North Carolina lawmakers seeking an exit from Raleigh in the coming days, the legislative activity has been, shall we say, frantic. One key portion of the debate to follow is the development of the legislature’s technical corrections bill, which lawmakers typically use to tidy up loose ends, or in some cases, inject new controversial policies into their spending plan. Given the speedy and secretive manner in which state legislators developed this year’s budget, many expected this year’s $23.9 billion spending plan—which did not allow for amendments—would be rife with necessary corrections. 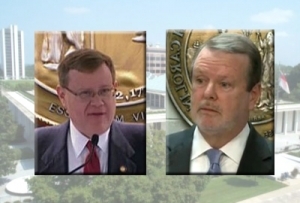 In case all of the activity leaves you dizzied, WRAL has a rundown of the highlights of that technical corrections bill, which is moving through the legislature today. And a major budget provision that threatens to drastically alter how North Carolina funds public schools is facing a change, although not in the way that public school advocates were seeking. Lawmakers have found money to keep the state Suicide Prevention Lifeline running. North Carolina’s Department of Health and Human Services has been relying on federal mental health grants to fund the hotline, which is run out of a Greenville-based call center. But policy changes no longer allowed the state to use those grants for it, and the hotline faced a July 1 cutoff. No money for the program was included in the $23.9 billion state budget, which took effect Tuesday following the legislature’s override of Gov. Roy Cooper’s veto. So, lawmakers included a provision in the annual “budget technical corrections” bill to provide $348,558 a year to operate it for at least the next three years. The technical corrections bill also provides some wiggle room for the planned Durham/Chapel Hill light rail line to obtain state funding and backs off a demand that people wishing to join the State Highway Patrol take out loans to pay for their trooper training. A $200,000 earmark for Donors Choose to pay for school supplies at 35 Charlotte-area schools has been removed from the budget. The nonprofit, which steers contributions to classroom teachers’ projects, rejected the money when officials learned it was targeting schools in the new district for Sen. Jeff Tarte, R-Mecklenburg, who faces a tough re-election effort this fall. Medicaid recipients will get $2 million to pay for eyeglasses in addition to eye exams, starting in January. Contact lenses would be paid for when medically necessary. Another $5.5 million would increase the payment rate for in-home aide services provided under the Community Alternatives Program for Disabled Adults. Cape Fear Valley Medical Center in Fayetteville will lose $4 million to pay for building costs associated with new inpatient behavioral health beds. That money will instead go to Betsy Johnson Hospital in Dunn, which is in the home district of House Rules Chairman David Lewis, R-Harnett. State veterans homes will be built in the Triangle and the Triad with $27.2 million the state is putting up to match federal funding. A provision in the budget allowed for cities to fund their own charter schools, and the technical corrections bill would let that funding go to capital expenses, such as buying or leasing buildings, in addition to operations. Regular charter schools receive no public money for buildings. Also on the charter school front, the state Department of Public Instruction is barred from making any cuts to the Office of Charter Schools in the coming year. The final section of the corrections bill would create the Legislative Commission on the Fair Treatment of College Student-Athletes, a 12-member panel that would study issues such as health insurance, injuries and profit-sharing and recommend any appropriate legislation.